With head coach Neil Lennon suspended by the club, head of academy coaching Eddie May took charge of the team but could only have looked on in dismay as Hibs were decidedly second best in the opening 45 minutes in which Simeon Jackson fired St Miren ahead. Kyle McAllister had a great chance to make it two for the Saints but Hibs made the most of his miss as substitute Oli Shaw equalised seconds later before former St Mirren players Darren McGregor and Stevie Mallan completed a remarkable comeback as the Edinburgh side eventually ran out worthy winners. After 25 minutes of sparring between the sides, St Mirren took the lead with a well-crafted goal, Brad Lyons sending in a low inviting cross the from the left for the unmarked Jackson to turn home from inside the six-yard box. 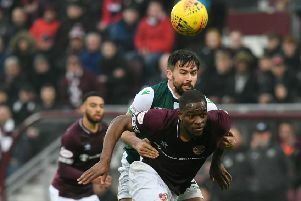 Hibs goalkeeper Ofir Marciano prevented Jackson doubling Saints’ lead a few minutes later, standing big to deny the striker after he'd been found free inside the penalty area by Kyle McAllister's free-kick. McAllister had a wonderful chance to wrap it up for the Buddies on the hour mark but was made to pay as Hibs took full advantage of that escape to equalise through Shaw seconds later. Having been second best for most of the match, Hibs found themselves ahead in the 70th minute, McGregor hammering the ball home after Flo Kamberi's header from Mallan's corner was blocked. And McGregor was the hero at the other end as Marciano saved from Stephen McGinn only to see the ball drop for Jackson, who thought he'd scored until the Hibs defender popped up to take the ball off his own goal-line before Marciano got down to save well from McAllister as the Buddies pressed for an equaliser. Former Buddies star Mallan wrapped up the points for Hibs three minutes from time, slamming the ball home after Gray's pass had picked out Shaw, who then rolled it into his team-mate's path. St Mirren: Hladky, P McGinn, Baird, Popescu, Erhahon, McAllister, Tansey, Lyons, S McGinn, Dreyer, Jackson. Substitutes not used: Homes, Flynn, Ferdinand, Jamieson, Breadner, Glover. Hibs: Marciano, Gray, McGregor, Hanlon, Stevenson, Slivka, Bartley, Horgan (Shaw 50), Gauld (Omeonga 75), Mallan, Kamberi. Substitutes not used: Dabrowski, Nelom, Murray, Mackie, Allan.